Once you’ve created a detailed buyer persona to help guide your website’s content, messaging, and design, what is the next step? Think about your buyer persona’s relationship to your website, and how they engage with it before, during, and after they become a customer. How do they prefer to discover, inquire, and learn about your offering? A customer journey map outlines what your personas, leads, and customers will experience once they hit your site. How they interact with your brand from the first point of contact until the sale, and even after. Whether you sell product, software, service, or other offering, a customer journey map is an effective tool to understand how your leads interpret and interact with your website. With both, it’s important to identify the key interactions at each stage, and pinpoint what the user is feeling, what questions they may have, and what motivates them. 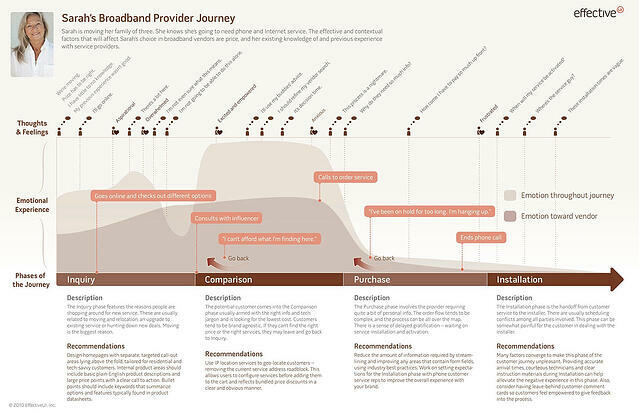 Many customer journey maps depict this information via an infographic or diagram for easy visualization. There is no one way to create a customer journey map. Choose the format that works best for your brand. 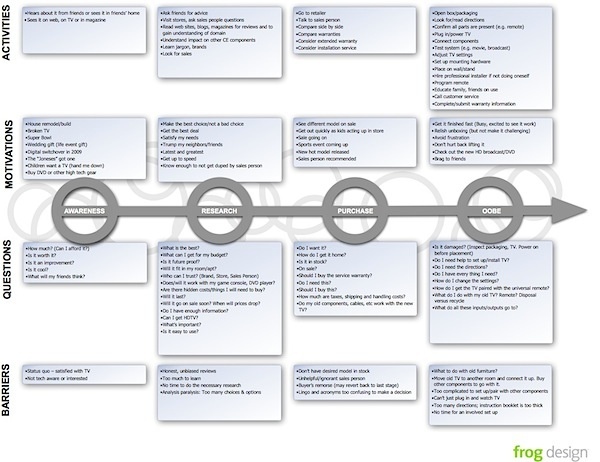 Later in this post, we’ll look at more ways to create a journey map. First, let’s dive into why your company should consider using a customer journey map. Mapping out your customer’s journey allows your organization to understand exactly how a person is feeling at each point of interaction with your brand; what key questions they may have (that perhaps you aren’t currently answering), and their specific needs at each stage of their journey. Using a customer journey map, your entire organization gains a better understanding of not only your customer, but how your website affects their decision making process. For more on the benefits of a customer journey map, watch this video. learns more about the customer than a buyer persona alone can tell them. Insights into the type of questions the customer seeks to answer, and the opportunities to improve and optimize their experience in finding those answers, helps align copy, CTA’s, and resources in a more effective way. Gains access to the before and after: How did the customer arrive, and where are they going next? This insight helps build a stronger, more optimized design approach and helps aid the natural flow and browsing behavior of the customer. Gains an understanding of how each customer moves through the website and sales funnel, allowing them to better understand where and how they can optimize for greater results. Channel Changes: What exactly is happening when your lead is arriving from or going to a different channel associated with your website. How can you make this transition smoother? Device Changes: How does your customer’s experience change when using different devices to browse your website. Your business’s journey map should be centered around the buyer journey stages: Awareness, consideration, decision, and after purchase. At each stage, what has motivated the lead to be there? What motivates them to keep moving forward? What are the emotional aspects attached to their motivations? Just as their journey unfolds, so too will their questions. What questions do they need to answer before they can move to the next stage? Is industry lingo, or a technically difficult concept, holding them up? What types of activity are you seeing from leads and customers at each stage? What actions are they taking to help move toward the next stage. What actions are they not taking? Are there any reasons that your visitor can’t move to the next stage? What are they? Is your price structure, onboarding, service, or overall process confusing them or giving them pause? Through customer research centered around site browsing/purchase behavior, customer interviews, and tools like website heat maps, you can gain a solid understanding of what customers may be experiencing at each stage. While documenting a customer journey is one thing, the actual way people choose to purchase, or make buying decisions, can be very different. Some prospects will skip everything between awareness and purchase, while others will stay in the consideration phase for months. It’s important to understand that not everyone’s journey is the same. Yet, with more information, analytics, and research, you will be set up to provide a streamlined experience for most leads; anticipating their concerns and questions to move them toward a purchase decision. If you’ve already performed your buyer persona research, you should have a solid foundation to start on your customer journey map. Next, you must develop an understanding of the interactions your personas will have with your website, and learn more about their specific actions. Of course, these actions are based on what their personality dictates. When approaching a deeper analysis, you will need to look at both analytical data and anecdotal. Uncover the data of your website visitors. Find out how they hit your site, what pages they visit, and how long they are engaged with your pages. The key is to use your website analytics to uncover their story. Using website analytics in conjunction with a tool like Hotjar, is advised, as analytics alone can provide an overwhelming amount data and be misleading at times. A long time spent on a page may not be an enthusiastic reader, but instead a confused lead searching for the next step. Once you have gathered the analytics and browsing behavior information, make a few hypotheses. Write out a short survey that you can send to customers about how they prefer to interact with you website to uncover more insights. Especially in today’s world of “big data” and “data-driven decisions” it’s easy to lose site of one key fact: Data can’t tell you the emotional part of the story. So, how do you get to the “why” of your website’s visitors’ actions? Ask on social media, ask via email campaign, ask in a three question survey - the worst thing that will happen is a “not interested,” and the best thing is a collection of personal stories detailing how and why a user behaves the way they do. Once you have gathered both analytical and anecdotal data to match to your buyer personas, you have everything you need to create your website’s buyer journey map. Here comes the fun part! Putting together all of your new insights, personas, hypotheses, and data and making your customer journey map. Design it in a way that best suites your organization. Some people choose infographic styling, while others choose a timeline view. However, your company chooses to represent your customer journey, make sure the design does not overshadow the main purpose: The website visitor’s journey and their story. Phases: Make sure you clearly depict the buyer journey phases (awareness, consideration, decision, and after purchase). 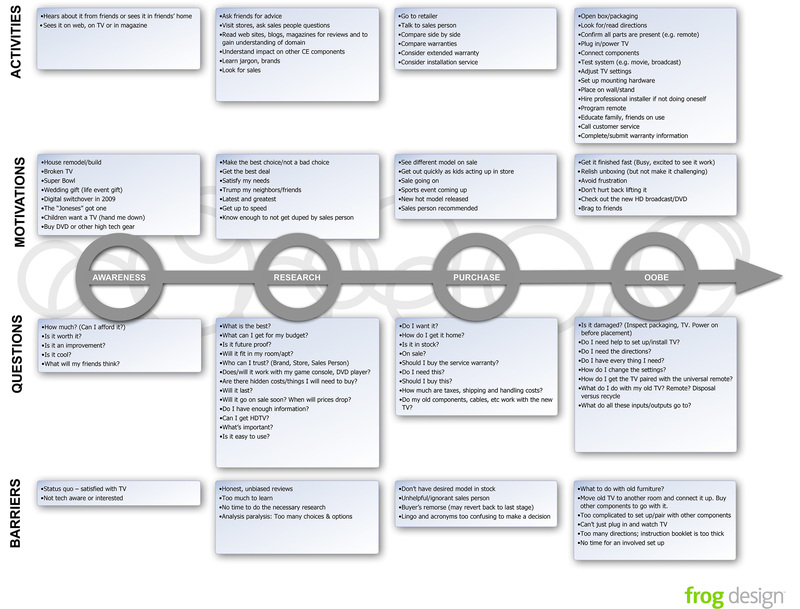 Personas: Whose journey are you mapping? 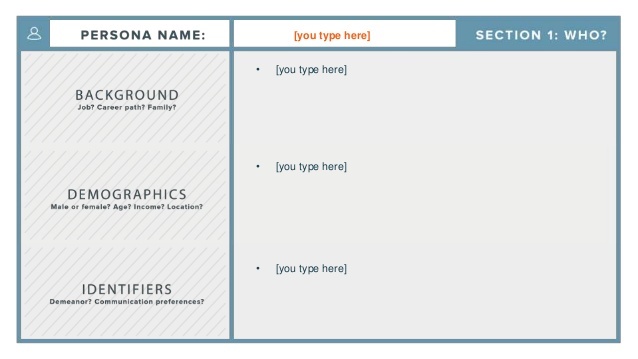 Refer to your buyer personas and include them, or break them out into individual maps. 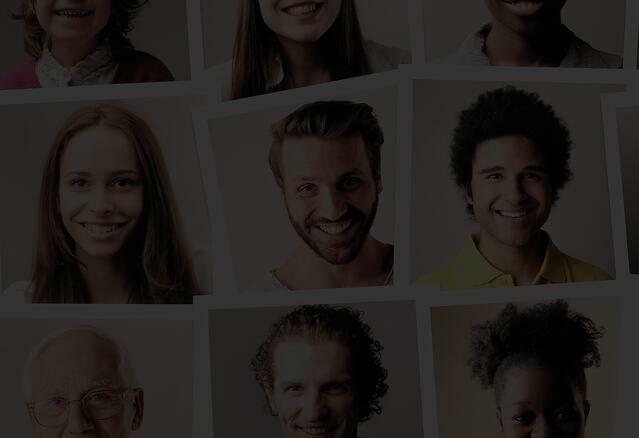 Channels: Where are these personas coming from? How did they find your site? Once they arrive what happens? Touchpoints: What actions are your visitors taking? Where are your key opportunities for interactions? What are their clicks, downloads, signups, etc.? Emotional Response: What emotions are they feeling at each stage? What are their questions/concerns/feelings? What moves them to the next phase, and holds them back from another? There are many different ways to create a customer journey map, and there are many channels, personas, and scenarios you could create. Start small - you don’t need every single option. The goal is to tell a story about a customer’s needs, what they are searching for, and how and if they find it on your site. Building a customer journey map is exciting and useful for the entire organization. Once you’ve created your first prototype - share it with your team. Remember, every time a lead or customer has a negative interaction with your brand or website, it lowers your brand’s trustworthiness and chance to delight a customer. By outlining your customer’s interactions, emotional state, and questions/concerns in a visual way, your organization has a better chance of discovering new ways to win customer loyalty and enhance the customer relationship with the brand. 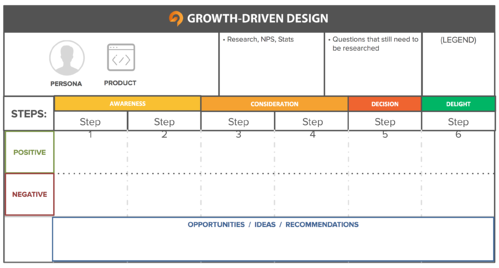 Ready to build your customer journey map? 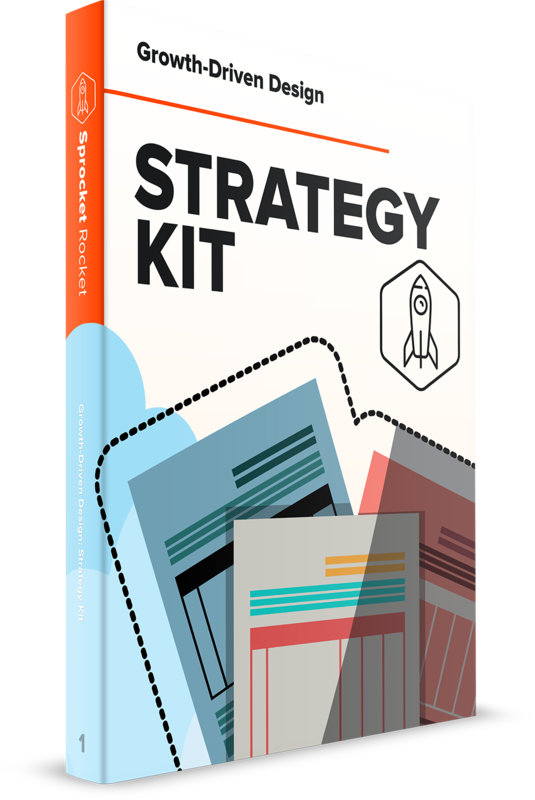 Get our Webite Strategy Kit, which includes a Customer Journey Map Template.